Performers bow at the end of the show . 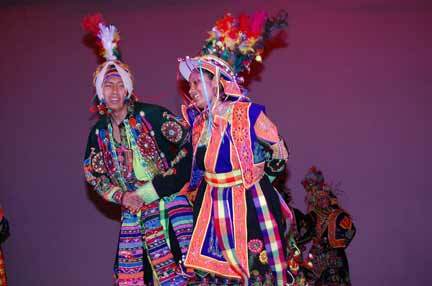 Dancers from Bolivia perform in the show. Every year Blair High School celebrates the International Show. 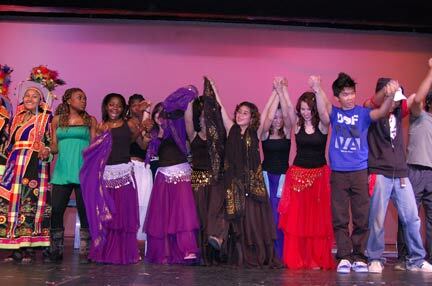 It is for international students to present their talents, cultures, and traditions. The 2008 International show was held on April 11th in the auditorium of Blair. The show was a unique cultural experience. It started at 7:00 p.m. and ended around 9:00 p.m. There were 14 groups that presented. 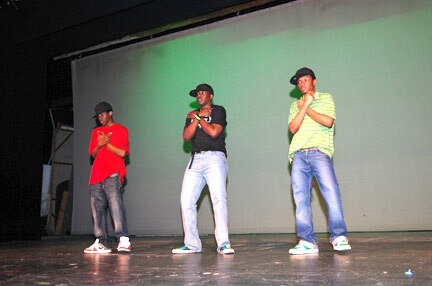 This year there were not only ESOL students performing in the show, but also many students from different backgrounds. Performers included students from India, various Latin American countries, Africa, the Caribbean, China, Bangladesh, Vietnam, and the U.S. It was a diversity of talents. “The show went really well. The students were wonderful. It was great,” Ms. Raba, one of the directors, said. The auditorium was crowded and the audience enjoyed it a lot. “It was so cute, I really liked it,” Semehar, a freshman said. This show also encourages students to participate in the coming years. “When students see the show, they become more interested in performing next year,” Marie, a freshman, said. Dancers from the Caribean perform an interesting dance.